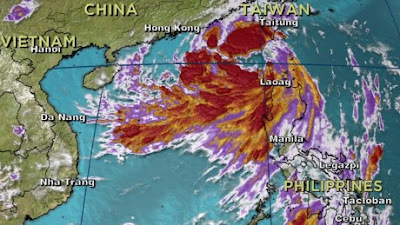 Lord, today we pray about Typhoon Nida, which visited the Philippines this weekend and is now heading toward Hong Kong. Thank you that the damage in the Philippines is not terrible at this point. Thank you that people are prepared in the Philippines, Hong Kong and China. We pray that neither flash floods nor landslides will result in the Philippines. If they do, we pray against any loss of life. We pray for China as it deals with all the cancelled flights and train routes. May people maintain good attitudes and patience as they await life returning to normal. May they be grateful that their leaders are prepared and avoiding destruction through taking these safety precautions. We do pray that Typhoon Nida would weaken as it approaches the region, so that any damage will be minimal. Thank you for modern tools that allow us to better prepare for dangerous weather. In Jesus’ name we pray, amen.